As one who enthusiastically followed the manned space program from its early days in the 1960's, reading news stories and magazine articles on new technology and research never ceases to amaze me. When China or Russia flies the next man to the moon, the level of fanfare will be more focused on how the U.S. is no longer considered the leader than on how much more improved technology is and how much lower the risk is. We now have over a million total hours of men living in space versus a thousand or so in 1969. Semiconductors have totally replaced vacuum tubes - with vastly better capability and ruggedness. Mechanics and physics knowledge now versus then are barely comparable. Software simulation predicts and optimizes virtually every possible scenario and compensates for it. Autonomous spacecraft have landed safely on asteroids only a few miles across at distances where radio communication takes half an hour to travel the distance - not 1/4 of a second as with to the moon. 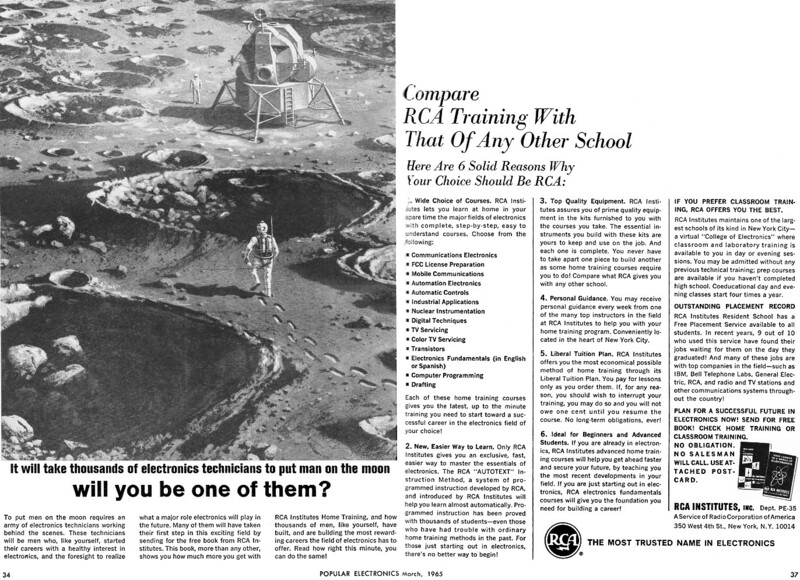 To really get a good idea of how little margin the Apollo 11 astronauts and their vehicle had, I recommend reading Hanes' "Apollo 11 Workshop Manual." It will take thousands of electronics technicians to put man on the moon will you be one of them? To put men on the moon requires an army of electronics technicians working behind the scenes. These technicians will be men who, like yourself, started their careers with a healthy interest in electronics, and the foresight to realize what a major role electronics will play in the future. Many of them will have taken their first step in this exciting field by sending for the free book from RCA Institutes. 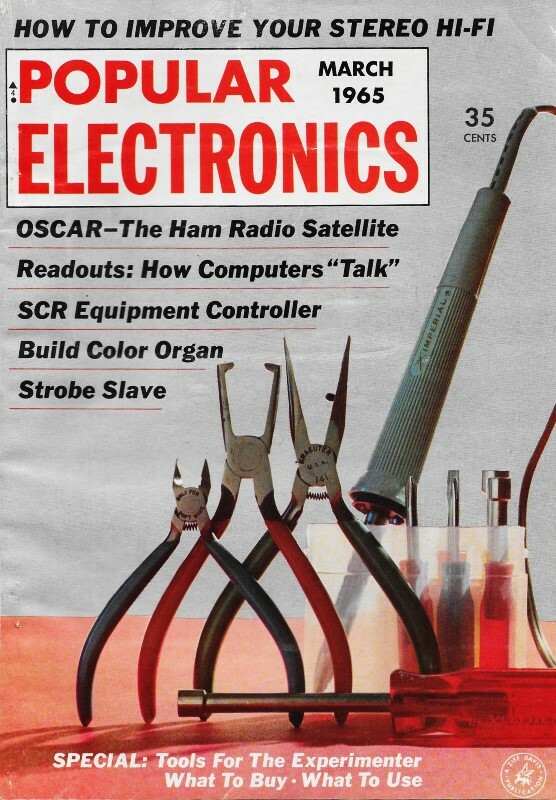 This book, more than any other, shows you how much more you get with RCA Institutes Home Training, and how thousands of men, like yourself, have built, and are building the most rewarding careers the field of electronics has to offer. Read how right this minute, you can do the same! Each of these home training courses gives you the latest, up to the minute training you need to start toward a successful career in the electronics field of your choice! 2. New, Easier Way to Learn. Only RCA Institutes gives you an exclusive, fast, easier way to master the essentials of electronics. The RCA "Autotext" Instruction Method, a system of programmed instruction developed by RCA, and introduced by RCA Institutes will help you learn almost automatically. Programmed instruction has been proved with thousands of students - even those who have had trouble with ordinary home training methods in the past. For those just starting out in electronics, there's no better way to begin! 3. Top Quality Equipment. RCA Institutes assures you of prime quality equipment in the kits furnished to you with the courses you take. The essential instruments you build with these kits are yours to keep and use on the job. And each one is complete. You never have to take apart one piece to build another as some home training courses require you to do! Compare what RCA gives you with any other school. 4. Personal Guidance. You may receive personal guidance every week from one of the many top instructors in the field at RCA Institutes to help you with your home training program. Conveniently 10' cated in the heart of New York City. 5. Liberal Tuition Plan. RCA Institutes offers you the most economical possible method of home training through its Liberal Tuition Plan. You pay for lessons only as you order them. If, for any reason, you should wish to interrupt your training, you may do so and you will not owe one cent until you resume the course. No long-term obligations, ever! 6. Ideal for Beginners and Advanced Students. If you are already in electronics, RCA Institutes advanced home training courses will help you get ahead faster and secure your future, by teaching you the most recent developments in your field. If you are just starting out in electronics, RCA electronics fundamentals courses will give you the foundation you need for building a career! 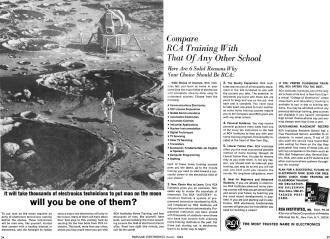 If you prefer classroom training, RCA offers you the best. RCA Institutes maintains one of the largest schools of its kind in New York City - a virtual "College of Electronics" where classroom and laboratory training is available to you in day or evening sessions. You may be admitted without any previous technical training; prep courses are available if you haven't completed high school. Coeducational day and evening classes start four times a year. RCA Institutes Resident School has a Free Placement Service available to all students. In recent years, 9 out of 10 who used this service have found their jobs waiting for them on the day they graduated! And many of these jobs are with top companies in the field - such as IBM, Bell Telephone Labs, General Elec­tric, RCA, and radio and TV stations and other communications systems throughout the country! Plan for a successful future in electronics now! Send for free book! Check Home training or classroom training. No obligation. No salesman will call. Use attached postcard.